Crime fiction reviewers and bloggers are a major influence on what I read. In reality I have enough books to get me through (at least) the next couple of months but reading other people’s reviews means that my reading pile just gets higher and higher. And not everything I read I would have picked up through my normal channels. 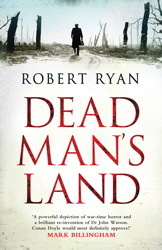 Dead Man’s Land by Robert Ryan is one such book. It’s set in the trenches of the First World War and features as its protagonist Doctor John Watson, the creation, of course, of Arthur Conan Doyle. I tend not to read books featuring other people’s character but I was sufficiently intrigued by a review from the excellent blog Novel Heights to borrow the book from my library. Dr John Watson joins the trenches of Flanders Field to use his medical expertise to help the wounded men. But he soon realised that this War is different to his previous experiences of conflict in Afghanistan. Not only are soldiers dying from the effects of gas, shelling and gunshot wounds but he also believes a killer is at work in the trenches. For what easier place would a killer find to hide than amongst the devastation of the French battlefields? I have read the Sherlock Holmes stories over and over again since I first picked them up as a teenager. However, I do think that there is scope for portraying both Holmes and Watson in a way other than those written by Conan Doyle, as the TV series Sherlock recently proved. In fact, Ryan’s portrayal of Watson was essentially the man in Conan Doyle’s stories and I thought the writer did a good job in capturing the essence of the character. Watson come across as both compassionate and tenacious in the hunt for the murderer. There are plenty of likely suspects and the war has attracted people from around the world, not all of whom are in France for idealistic reasons. The book is also written from the viewpoint of Mrs Gregson, a VAD nurse with suffragette sympathies who shrugs off the disapproval from the hospital Matron to accompany Watson to the field hospital. These scenes give a flavour of the tensions and petty rivalries rife in the hospitals. Overall it was an interesting read and gave another view on the horror of the trenches. The pace dropped in a few places but the characterisation was excellent and it has made me curious to read the writer’s other books. Robert Ryan will be talking about historical crime fiction at Victoria Library in London on the 18th February. Further details can be found here. Sarah – I’ve been hearing about this one too. I’m glad that you found it enjoyable. Like you I don’t typically go much for other people’s characters as protagonists, but I’m glad it works well in this case. 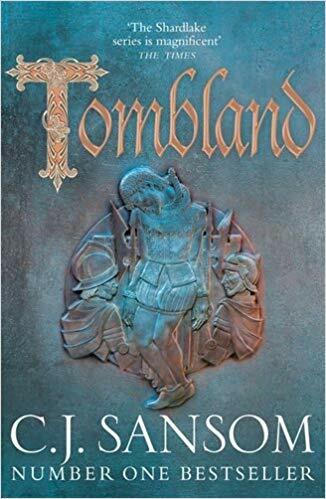 I have to say too that the historical aspect of the story is appealing to me – I always like well-written historical mysteries. And this is, as ever, an excellent review for which thanks. Thanks Margot. I was pleasantly surprised by the portrayal of Watson and the book made me want to go back to the original stories which is quite an achievement. Despite being a confirmed Sherlockian, for me the sheer tonnage of pastiches featuring the Conan Doyle characters, especially now that they are out of copyright, is so daunting as to preclude any serious engagement (unless I wanted to make it my life’s work) – but it really helps to read a positive review like this to see if any stand out from the madding crowd (sic) – thansk Sarah, much appreciated. I haven’t come across that phrase before Sergio but I too am a confirmed Sherlockian. As I mentioned at the beginning of the post, it was a good review that made me pick up the book. Last year, I was doing a War Thru the Generations challenge for World War I, and I had a hard time finding books I enjoyed. This would have been perfect. Oh well, it came out too late for that, but I will definitely seek it out. He also has a series set in World War II that I might like. Although it looks like they may be hard to get in the US. I don’t know how easy the books are to find in the US Tracy. I’d be interested to hear. I will definitely keep this author on my list. Looks like I could get a copy through ABEbooks,com, but I may wait and check some used book stores and book sales first. And… I finished Crooked House by Agatha Christie and really enjoyed it. Thanks for recommending that one to me. Now I have to see if I can write a post about it that does it justice. It’s a clever little book isn’t it Tracy? And belies the notion that AC is just a ‘cosy’ writer. Nothing comforting in that novel in my opinion and one of her best. Glad my review piqued your interest. I think you enjoyed it more that I did – in the end I just felt sorry for poor Watson who couldn’t be left to solve anything on his own! Well it was always the case wasn’t it Sue? In ‘Hound of the Baskervilles’ Watson thinks he’s doing all the work and in fact Holmes is masterminding the whole thing. I haven’t come across this one – it sounds interesting. On the list it goes! Hope you like it Moira. I think the nurses clothing has plenty of scope for your blog. So, for example, when I discovered your blog, I added it to my feed and then it lets me know when you have posted. I then look at the post within the feed, and if I feel like commenting (usually the case with yours Keishon) I open the post up in my browser and comment as normal. It allows me to look at a wide range of blogs without actually hopping around the internet. Sue’s blog Novel Heights is on there too. I read the review within the reader and was interested enough to then open it up and note the name of the book. I use a feed reader as well. I was just wanting to know what resources you were using for reading material. Used to depend on Maxine for new books so it’s good to see you reading voraciously. I read blogs too but also follow Euro Crime’s International Dagger Eligible lists and their reviews as well. I pay a lot of attention to Lynn Harvey’s reviews since she introduced me to Antonin Varenne. Thanks your response was helpful. Ooops. I had a feeling when I was typing my comment that you’d know what a feed reader was! Many of the crime fic sites I follow are listed on the right hand side of the blog. However, I think I’m going to do a list of non-crime blogs because I pick up a few suggestions that way too. Watch this space,…. And here’s a second “good review” that’s going to make me pick up this book. Watson in a WWI story? Now that’s original. He basked in reflected glory for years and it’s nice to see him come into his own. Does Ryan say why he picked Watson from hundreds of secondary characters in crime or detective fiction? In fact, I wonder why he borrowed Watson rather than create his own protagonist? I’m not sure why Watson appears in this story to be honest Prashant. I’d be interested to know too. Sergio commented that the characters are now out of copyright so that does give writers the freedom to use them more creatively I’m sure. I’m a Sherlock Holmes fan and I loved the new twist of the TV series, so I’m totally open to other new treatments of those familiar characters (although I’d been disappointed by The House of Silk). This one sounds good to me! I haven’t tried ‘The House of Silk’ but I’m up for the read sometime. There’s a very good short story featuring Holmes but I can’t remember the author as I read it in an anthology. I must try and find it.